Successfully Added HK Warehouse Elephone C1 Max Android Phone - Quad-Core, Android 7.0, 2GB RAM, 6-Inch IPS, Dual-IMEI, 4G, 13MP Dual-Cam (Black) to your Shopping Cart. The Elephone C1 Max is a remarkably cheap Android phone that treats you to breathtaking visuals on its large 6-Inch display. Featuring IPS technology, this screen treats you to a stunning visual experience while you enjoy your favorite games, films, and Apps. The screen itself supports 720p, meaning that it displays all your media in crisp HD resolutions. If you are looking for an affordable device that offers plenty of possibilities for mobile entertainment, the Elephone C1 Max is the perfect Android phone for you. Underneath its large screen, this 6-Inch smartphone packs a sophisticated Quad-Core processor and 2GB RAM. This hardware comes along with 32GB internal memory for you to keep all your files. For those of you that need even more storage, this Android smartphone holds a 64GB SD card slot that lets you store plenty of files and media. With its fingerprint scanner, your Android phone delivers high security and efficiency. From now on, you’ll be able to access all your files in the blink of an eye with the simple touch of a finger. With Android 7.0, your smartphone lets you undergo a smooth user experience. It furthermore treats you to two SIM card slots, Dual-IMEI numbers, and 4G support. Thanks to this, you’ll always stay connected no matter where you’re at. With a 2800mAh battery, it supports up to 8 hours continuous usage time. This is more than enough for you to browse the web, make calls, play games, and snap pictures with its 13MP Dual-Rear camera throughout the day. 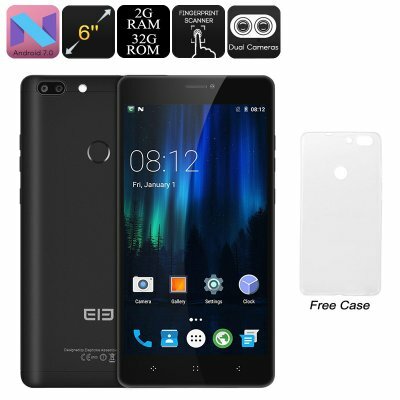 The Elephone C1 Max comes with a 12 months warranty, brought to you by the leader in electronic devices as well as wholesale smartphones..